It comes, & diris cincta cohors gladiis. Quòd tua complureis allicit olla malos. In praedam canibus se dedit ipse suis. An evil-minded band of ruffians and thieves accompanies you about the city, a gang of supporters armed with lethal swords. And so, you wastrel, you consider yourself a fine lordly fellow because your cooking pot draws in crowds of scoundrels. - Here’s a fresh Actaeon - he, after he grew his horns, became the prey of his own hunting dogs. Wer schelmen nert, ist unglucks werd. 1. 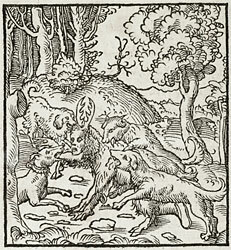 Before the 1536 edition, Wechel editions used an earlier version of the woodcut in which the horns were more like a goat than a deer’s antlers. 2. Scaeva, ‘evil-minded’. The capital letter suggests that the Latin word could be taken as a proper name in the vocative case, i.e addressing one Scaeva. 3. 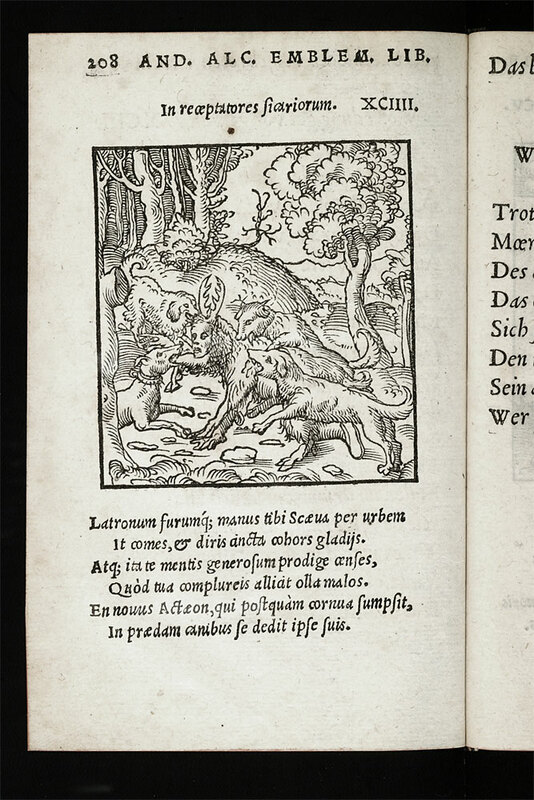 For the story of Actaeon turned into a stag and killed by his own hounds, see Ovid, Metamorphoses 3.138ff. Similarly, the hangers-on will destroy the one who has fed them.